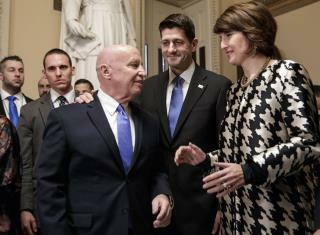 (Newser) – Congressional Republicans delivered an epic overhaul of US tax laws to President Trump on Wednesday, bringing generous tax cuts for corporations and the wealthiest Americans while providing smaller cuts for middle- and low-income families. In a re-vote due to a last-minute hiccup, the House passed the massive $1.5 trillion tax package that affects everyone's taxes but is dominated by breaks for business and higher earners, per the AP. Democrats call the legislation a boon to the rich that leaves middle-class and working Americans behind. The vote was 224-201 and came hours after the Senate's early morning passage along party-lines. It is the first major overhaul of the nation's tax laws since 1986. On Twitter and in White House remarks, Trump hailed the outcome, his own efforts and the work of GOP allies, including Majority Leader Mitch McConnell of Kentucky, who had drawn the president's wrath for the Senate's inability this past summer to dismantle the health care law. "Our team will go onto many more VICTORIES!" Trump tweeted. Sad that liberal followers believe erroneously that the Reagan tax cuts didn't work and liberal leaders know they did and do not want them to succeed in enriching Americans. Sad and pathetic. I didnt expect most gop,s to vote for truth but i did think enouogh would have the interest of the majority of midlle america when they voted.